The grill cover weight in 4 pound, compare to the competitors which claimed also made of heavy duty 600D Oxford material but only 2 pound weight. We think you must know someone is kidding you. Sometimes you make a perfect meal while waiting for your grill to cool down,the sky opens up and your poor grill get soaked. Or you turned off the burners and went inside for a delicious meal, completely forgetting about your grill for days, even weeks at a time. You should cover your grill once it has cooled down after every use. Stainless steel grills must be kept covered between uses to ensure lawn chemicals and other corrosive agents won't act on the metal and tarnish it. ALL You need is our GRILL COVER. It is built to stand up to weather no matter where you are. As we know, most weakness point in grill cover is the seam. Most grill cover seam is visible from outer surface, this stitching construction cause the seam weathering easily, lead to rip and tore. Although the material of cover is waterproof, but not the seam, it will permeate from the seam, soak your grill. We have improved it! We use the built-in double needle stitching seam construction. Because of the seam inner the cover, so the changeable weather not affect the seam, prevent weathering to tore. At the meantime, the water could not permeate, protect your valuable grill. Double needle stitching make it more sturdy and durable, prevent tore. It protects your grill from Humid climates, Costal climates, Dry climates and all other climates. SAVE YOU NEARLY HALF BUDGET ON THE BBQ GRILL EXPENCE. 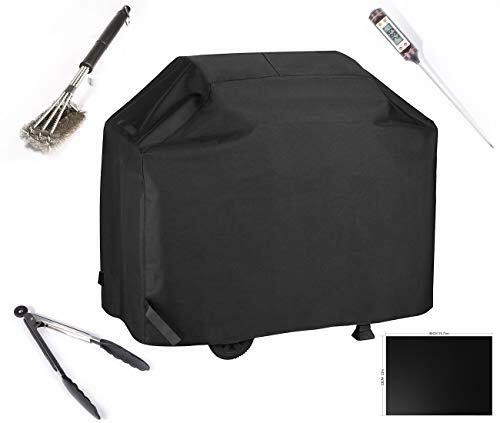 Usually you have to spend 80 bucks in the barbecue grill cover plus some grill tools( grill brush tong thermometer grill mat). We provide more and better tools than others competitors which sold barbecue grill cover including tools set in amazon. We have more steel wire and stronger design in Grill brush. Premium 100% Food Grade Silicone BPA and PVC free Rubber made into tong which can protect your hand burn. BUILT-IN DOUBLE NEEDLE STITCHING MAKE IT MORE STURDY AND WATERPROOF Our Grill cover is made of authentic heavy duty 600D Oxford fabric tough material which can support weather resistant, and rip resistant. With better sewing construction of our cover. Different from others, protect the seam not weathering. Prevent rip and tore. Protect your grill from the elements of forces, such as strong wind, sand storms, sun and rain. The cover builds to last through all seasons. WATERPROOF &UV RESISTANT- PVC coating for water resistant to keep the grill dry protect it and UV coating for reflecting the UV to prevent the cover fade. Meanwhile it stop dust out of grill keep it clean. Besides tie velcro straps up which on grill cover's both two sides make the most fit to your grill, tighten grill covers, prevent the gas grill cover from being blown off. Easy on&off your grill. Well-made handles help on&off to cover and remove easily. If you have any questions about this product by Tingze, contact us by completing and submitting the form below. If you are looking for a specif part number, please include it with your message.